Last week the yearning of a lifetime in ministry was fulfilled. I was in England and had the opportunity to visit Coventry Cathedral. I had read of its history and used its famous Litany of Reconciliation many times throughout Lent and particularly in Holy Week. I found myself within the remains of that great medieval cathedral bombed and burned on November 14, 1940. The next morning as the whole cathedral lay open to the sky, the Provost and a number of cathedral parishioners climbed over the rubble. In the midst, they found two charred roof beams one lying over the other in the shape of a cross. Carefully Howard lashed them together and carried them to the sanctuary, setting them up in the sight of all to see. I wonder if in his labour, he might have had in his mind and on his heart, those beautiful words of John Bowring’s great hymn. Having placed the cross he then proceeded to etch on the wall behind the altar the words “Father, forgive.” We recognize them as the prayer of Jesus from his Cross. Space restricted Howard from quoting our Lord ’s prayer in its entirety, “Father, forgive them; for they do not know what they are doing.” (Luke 23:34) But as time would have it, the simplicity of “Father, forgive” would speak volumes reminding us that all have sinned and fallen short of the glory of God. We all stand in need of redemption. 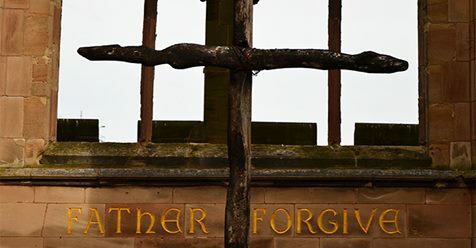 Those charred roof beams lashed together in the form of a cross, and those words etched into the sanctuary wall, would inspire the writing of the Coventry Litany of Reconciliation. The sentence with which it opens humbles us before God. In its read of the human condition, this Litany is as contemporary as the day it was first penned. In its brevity, it is memorable. In its simplicity, it is powerful. The sentence with which it closes is instructive as to how we ought to live. The Litany is prayed every day at noon in Coventry Cathedral – sometimes within the ruins of the former cathedral, sometimes within the marvels of the modern one. It is prayed every Friday at noon in cathedrals and parishes around the world that are members of the Community of the Cross of Nails. I invite you one and all, to pray this Litany at noon (or at some other perhaps more quiet time) on Monday, Tuesday, and Wednesday in Holy Week. It may be that you pray it alone, or in the company of others. Some of you will pray it in your church. Others of necessity will have to pray it in other places. Try not to recite or rush your praying. Make each confession with a pause for lament and contrition of heart before uttering the plea, “Father, forgive”. Make each confession with a deep yearning to know more fully the reconciling love of God in Christ and our calling to be ambassadors of that love. Praying this Litany, may our hearts and minds be made ready to approach the solemnities of Maundy Thursday, Good Friday, and Holy Saturday with deep devotion to our Lord Jesus who “emptied himself…and being found in human form humbled himself and became obedient to the point of death, even death on a cross” (Philippians 2: 7-8).